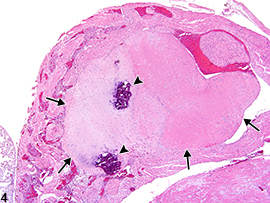 Heart, Atrium - Thrombus in a male Swiss Webster mouse from a chronic study. A thrombus is present in the right atrium (arrow). 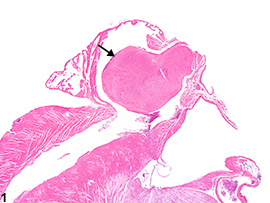 Heart, Atrium - Thrombus in a male Swiss Webster mouse from a chronic study (higher magnification of Figure 1). 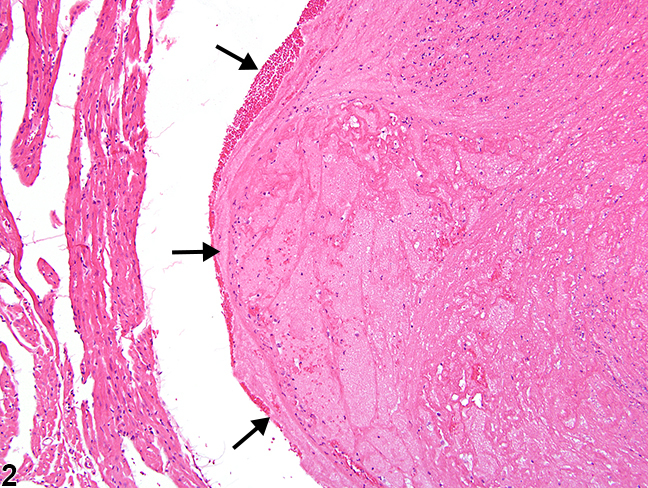 Multiple layers of fibrin, erythrocytes, and scattered inflammatory cells (arrows) comprise this right atrial thrombus. Heart, Atrium - Thrombus in a male Swiss Webster mouse from a chronic study. 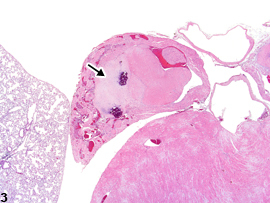 A large thrombus with two foci of mineral fills the left atrium (arrow). 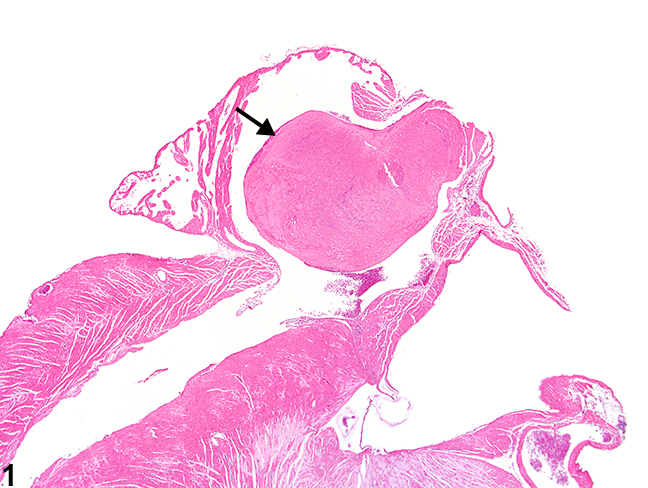 Heart, Atrium - Thrombus in a male Swiss Webster mouse from a chronic study (higher magnification of Figure 3). 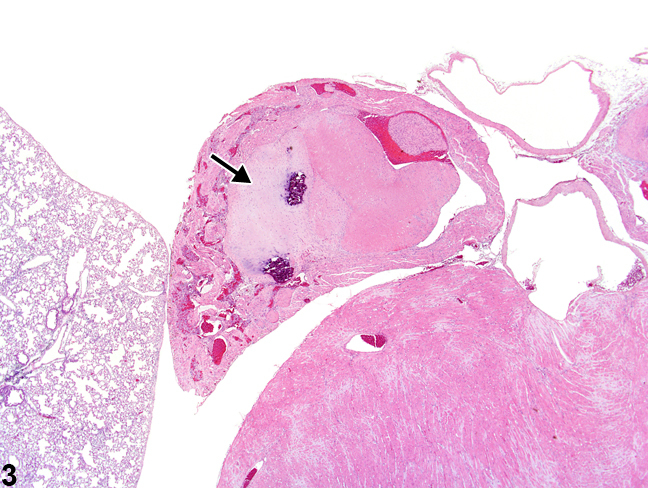 This thrombus in the left atrium (arrows) has two dark, basophilic areas of mineral (arrowheads). Although thrombi can be seen in the right ( Figure 1 and Figure 2 ) or left ( Figure 3 and Figure 4 ) atrium, the most common site of spontaneously occurring and chemically induced thrombi is the left atrium. In acute situations, the lumen is distended by a mass of laminated fibrin layers, leukocytes, and red blood cells. 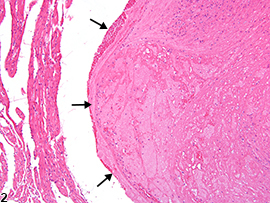 In more chronic cases, there is more organization of the thrombus (e.g., presence of vascularized fibrous connective tissue, inflammation, and/or cartilage metaplasia), with potential attachment to the atrial wall. Spontaneous rates of cardiac thrombi were determined for control Fischer 344 rats and B6C3F1 mice: in 90-day studies, 0% in rats and mice; in 2-year studies, 0.7% in both genders of mice, 4% in male rats, and 1% in female rats. Chemical-induced atrial thrombi may be closely related to myocardial injury, endothelial injury, circulatory stasis, hypercoagulability, and impaired atrial mechanical activity, such as atrial fibrillation, which could result in stasis of blood within the left atrial appendage, contributing to left atrial thrombosis. Review of the NTP database suggests that atrial thrombosis is usually associated with death in affected animals. Heart - Thrombus should be diagnosed but should not be graded. Site modifiers such as "atrium" or "ventricle" should be included. The pathology narrative should indicate whether it is on the left or right side. Secondary lesions associated with thrombi such as inflammation, mineral, or metaplasia should not be diagnosed separately unless warranted by severity. Necrosis caused by a thrombus should be diagnosed separately, and its association with the thrombus should be discussed in the narrative.